Pinnacle’s Ultra Poly Clay is the single finest clay composition available today. Use auto Detailing clay to deep clean car paint, glass and chrome. Ultra Poly Clay is a patented clay formula made exclusively for Pinnacle Natural Brilliance. Its texture and elasticity are unlike any other clay you’ve ever used because the Pinnacle team designed it that way. More than a year of research went into making a fine grade clay specifically for those who meticulously maintain their vehicles. There are very few clay manufacturers in the world and many of them produce the same type of clay, just in different colors. While these clays do serve a purpose, none come close to Pinnacle Ultra Poly Clay. Ultra Poly Clay stands apart from the rest because it is safe enough to use monthly or as needed for spot cleaning. Regular use of the clay will keep paint contamination from making a lasting impression on your finish. This unique clay is just as effective on paint contamination as our original Poly Clay and has all its paint-saving advantages. Paint contaminants surround your vehicle. Contamination can include visible things, like tar and tree sap, or it can be less visible pollutants, like industrial fallout and rail dust. As you drive, these particles hit the vehicle with such impact, they pierce the clear coat and remain there. Your vehicle becomes a magnet for airborne pollution. No amount of washing will remove it. Over time, the contaminants oxidize and leave tiny, orange rust spots in your paint finish. Detailing clay was developed in Japan in the early 1990’s as a safe and effective way of removing industrial fallout from the then-new clear coat finishes. To date, detailing clay is the only proven way to remove embedded contamination without polishing or compounding. From the infancy of clay, the only grade available to consumers has been a medium grade, designed to remove contamination twice a year. This grade removes everything from the paint, including wax. Since vehicles are bombarded by pollution every day of the year, consumers wanted a finer grade of clay to clean the paint as often as necessary with no adverse effects. The industry has been working toward this goal ever since. Why use Pinnacle Ultra Poly Clay? 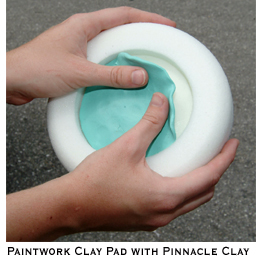 Pinnacle Ultra Poly Clay is designed for frequent use. Whereas our original clay is recommended to use once or twice a year, this ultra fine grade of elastic detailing clay can be used as often as necessary to maintain a slick, reflective finish. Use it once a month or as needed for spot-cleaning – Pinnacle Ultra Poly Clay is gentle yet effective on all types of paint! Although Ultra Poly Clay is a very fine grade of clay, it is effective at removing contamination build-up (6 -12 months without claying). Ultra Poly Clay retains all the characteristics of our original Poly Clay. The difference lies in the Ultra Poly Clay’s softer, finer consistency that is gentler on the vehicle. Plus, Pinnacle Ultra Poly Clay has superior elasticity as compared to heavier grades of clay. The clay can be reshaped and stretched repeatedly without losing its flexibility. Properly stored in its plastic case, Pinnacle Ultra Poly Clay will retain its elastic nature and workability. Use Pinnacle Ultra Poly Clay as often as necessary to maintain a silky, slick finish on your vehicle. * Note: When using this or any clay, avoid applying pressure. Applying pressure to anything you’re rubbing on the paint (clay included) will make it abrasive. You want to avoid rubbing the clay against the paint. It should glide across the lubricant. Use only enough pressure to maintain contact between the clay bar and the paint surface. The clay will do the rest. As always, keep the surface well-lubricated. Pinnacle Clay Lubricant creates a slippery layer of lubrication – as much as a spray wax - to protect your vehicle during the clay process. The professional quality lubricant contains no solvents to strip wax and actually preserves the clay by keeping it moist. 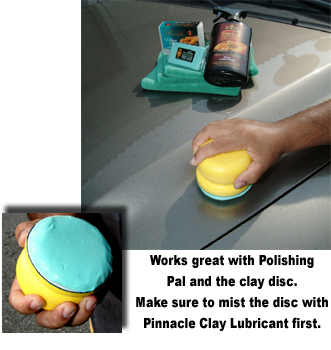 If the clay leaves any residue on the vehicle, use Pinnacle Clay Lubricant and a soft microfiber towel to clean the area. Finally, you can clay as often as you want to maintain a clean, slick shine on your vehicle. Pinnacle Ultra Poly Clay is the clay for enthusiasts and perfectionists who want the satisfaction of a freshly clayed vehicle and the confidence that comes with using Pinnacle. I give 5 stars easily!!! 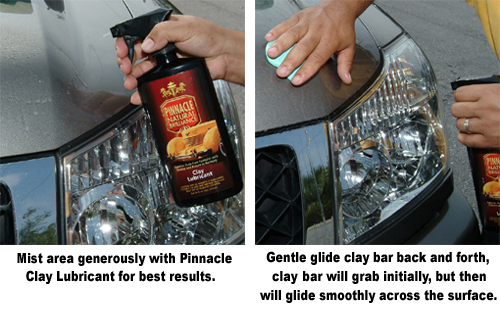 Pinnacle products are great for car detailers! I noticed some black dust embedded in the paint as well as paint discolorations as well. The clay bar was able to remove the black dust in the paint and some of the marks though I had to make several passes to completely remove it. The rest of marks I removed with Klasse All In One another great product. My first time using clay, and this product did a nice job on a car with only a light level of dirt. Really impressed with the resulting cleanliness after claying. ProsNice job an adhering to small particles of dirt. Easy to use, easy to fold and manipulate. Does a great job for removing embedded contaminants. I have a white car and I like to keep the paint free of contaminants. This clay is perfect for regular use. Cons- On really dirty cars (never clayed or rarely clayed), you will need many passes as it won't pick everything, or use a medium or more aggressive clay.